It’s Random Recipe time again and as a tribute to the birth month of this fabulous event, we have been given the task of picking a recipe from the book we used when we first took part in this challenge. I was mightily pleased about this as I was panicking rather at having to use the Valrhona chocolate book which CT gave me for Christmas. There isn’t a single simple recipe in it – in fact they all look way beyond my capability. Divine by Linda Collister is a much more accessible book. Last year I made butterscotch swirl brownies which were a great success; what would this year bring I wondered? This year, CT did the honours again and picked page 76, which is an American Pecan and Chocolate ‘Coffee Cake’ – so called because it is to be eaten with coffee rather than actually containing coffee. This was a relief to me as I don’t like coffee, but a rather confusing name. The recipe required a bundt tin. I’ve been on the look out for a silicone ring mould for ages but have had no luck so far, so I used a loaf tin instead. I substituted yogurt for sour cream and added some chilli into the mix. Roughly ground 100g toasted pecans in a coffee grinder together with 100g 70% dark chocolate (G&B), 4 tbsp light muscovado sugar, 1 tsp cinnamon and 1/2 tsp cayenne pepper. Creamed 250g unsalted butter with 150g cardamon sugar (caster) until light and fluffy. Sifted in 300g flour (half wholemeal spelt, half white), 2 tsp baking powder, 1/2 tsp bicarb of soda and a pinch of salt. Folded this in as gently as I could. Greased and lined the bottom of a 900g loaf tin. Spooned nearly half of the mixture into the tin – nearly half as it looked as though there was going to be too much mixture AND I was right. Sprinkled nearly half of the chocolate mixture over the top. Spooned in most of the remaining mixture. Sprinkled on most of the remaining chocolate mixture. Pressed this down with the back of a spoon. Carried out the same process with the remaining mixtures using a mini loaf mould. Baked the large loaf at 180C for 45 mins (with tin foil over the top for the last 15 minutes to stop the top burning) and the little one for 17 mins. I had the mini loaf warm from the oven and it was heavenly. It had a crisp crunchy crust and a soft interior interspersed with bits of spicy chocolate streusel. It was deliciously buttery and not nearly as sweet as I had imagined. It was well flavoured and had just a touch of chilli warmth to it that wouldn’t have been easy to identify if you didn’t know it was there. The cake looked really pretty with the dark struesel layers contrasting with the pale coloured crumb. All in all I was truly impressed and will be making this one again for sure. Thank you once again Dom for getting me to bake something I probably wouldn’t have contemplated and all because of the word “coffee”. Thank you Kit. The cayenne worked really well. It was just a barely discernible heat that shouldn’t put off any chilli haters but added a certain something. oh my! This looks divine! Chocolate, chilli, cardamon & pecans…..fabulous. Yes, have a feeling our tastes might be quite similar!! Laura, thank you. It was really interesting to have the chilli in only a small part of the cake – really liked the contrast. I love this sort of cake – an extra layer of intense flavour without having to frost the cake! Thanks Suelle. Think this is a very good point you make about baking an interesting cake and thus dispensing with the need for icing. Now pondering … some of the nicest cakes I’ve made haven’t actually had any sort of icing. Will have to use this technique more often. This looks scrumptious. 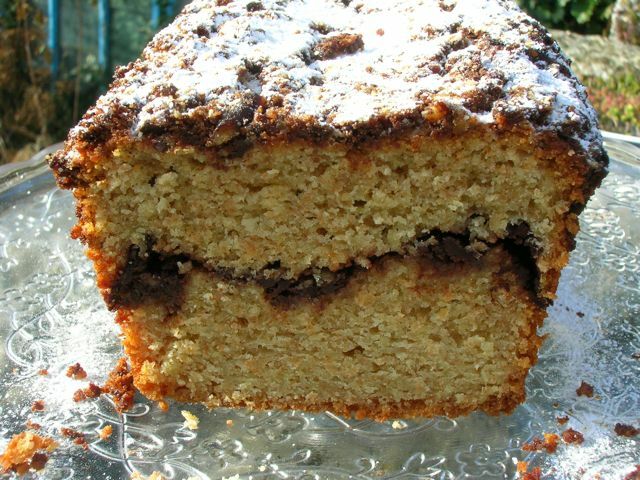 I love streusel cake. Oh thanks so much for the mention on Foodies 100 Ten at Ten. Thanks Debby, you have a lovely blog and well deserved the mention. But I’m truly shocked you have no chocolate in the house!!!! Hope you have a great weekend. oh god I am totally lost in that photo of the cake… I want a slice now… I am sorely tempted to put down my pathetic excuse for work, rush home and bake it… divine… what a great pick… so glad you enjoyed the challenge… and clearly lucked out… fabulous stuff! This looks scrumpy, esp. that layer of streusel. Yes I always found that ‘coffee cake’ thing confusing! Looks delicious. Thanks Janice – I’ll have to be less dismissive about coffee cake in future! Thank you Johanna. The crumb was lovely, much like a Madeira cake. Therre seem to be a few of us who are in the “don’t like coffee’ camp. Ren, thank you. This was my first attempt at streusel and it will not be my last, I was really impressed at how easy it is to make a simple loaf so much more exciting. Yum! The ‘coffee’ in the name confused me too, but I guess that’s good if you don’t like coffee, you can have it with tea? 🙂 Just wondering, as I don’t have a coffee grinder, is there any other way of grinding up the pecans you can suggest? Hi Xinmei, nice to see you here. In my book you can eat cake anytime, anywhere and with anything! As for grinding up the pecans, if you don’t have a food processor, you could try bashing them with a rolling pin in a plastic bag. Now, if only I hadn’t polished off the last piece yesterday! Thanks for your comment and for visiting. This looks delicious!! Love the streusel layer. A great coffee cake without coffee in it 🙂 not that I drink coffee anyway. Yeah Ros, another one for the non coffee camp – very silly name I reckon! PS – that should be bake not bale! Thanks for dropping by Maha, let me know how it goes if you do make this. This looks a lovely cake and that seam of goodness running through it is delish! CC, how difficult for your mother – I’m assuming it’s all nuts? You could always substitute something else – not sure what, but I expect something would spring to mind. This looks really lovely, and so interesting to hear – I am fairly sure I’ve skipped over recipes before because they are called ‘coffee’ cakes. What a good excuse to go and revisit some of my books. Thanks for sharing this. This is stunning! I was similarly confused about coffee cake for a long time, until enlightenment last year via a Daring Bakers’ Challenge set me straight. Might have to attempt de-dairying this one so I can eat it – it looks so good!